Rev. Micah Sturm arrived at Grace Church in June 2012. He was born in Greeneville, Tennessee, and preached his first sermon at the age of 14 from the Old Testament text of Nahum 1:7. Our pastor is a 2001 graduate of Trevecca Nazarene University, with a Bachelor of Arts degree in Religion and a minor in Pastoral Ministry. While at TNU, he met Halisha and were married in 2002. Halisha is also a 2001 Trevecca Nazarene University graduate, with a Bachelor of Science degree in Early Elementary Education. She is a dynamic educator with the gift of teaching. Pastor and Halisha are the proud parents of Ella Grace! Pastor Micah was ordained an elder in the Church of the Nazarene by General Superintendent, Dr. Jesse Middendorf, at the Tennessee District Assembly in 2003. He and Halisha have served congregations in Alabama and Tennessee. Pastor's hobbies include: reading, collecting books, American history, piano, and helping Halisha with her yard work. Halisha enjoys time with family and anything involving flowers and landscaping. They both love their two nieces who live just outside of Nashville! Preaching is Pastor's passion and he seeks to be a student of the Word, empowered by the Holy Spirit to proclaim it! Becky has been a member of Grace Church for over thirty years. She has served as office manager since 1994. She serves diligently and with a humble spirit. She is involved in many ministries at Grace and is an integral part of the church leadership. Becky is married to Tom and the mother of Amy & Tina, her grown children. Abigail and Eli, her grandchildren, are her pride and joy. Rev. 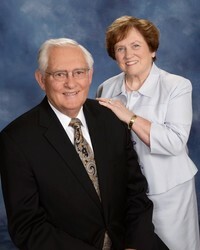 Jerry and Pat Hanson served as pastor from 1992-2008, the longest tenure of any pastor in the history of Grace Church! He is a man of God who loves people and has a gift to work with his hands. The numerous improvement projects that he has completed over the years is too many to list! Devoted to the Word of God, Pastor Hanson currently serves as the Friendship Class teacher and is extremely effective in this role. Pastor Hanson and Pat are faithful supporters of Grace Church and an invaluable asset to our ministry team! Pat is a retired educator with Hamilton County Schools and is active in choir, Women's Bible Study, Nazarene Missions, and hospitality. We are blessed to have this couple as an integral part of the ministry of Grace Church!